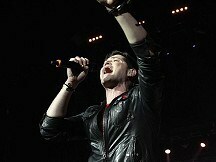 Around 12,000 have turned out to see Irish rockers The Script in Northern Ireland. Bassist Ben Sergeant celebrated his birthday by downing a bottle of beer in one as singer Danny O'Donoghue led the crowd in a rendition of happy birthday. The Dublin act played their last gig in Bangor, Co Down, before two months touring the US. Band members lamented the fact that they would miss real tea - before exhorting the Ward Park crowd in bawdy terms to even greater drinking feats. The response was liberal showers of warm beer hurled by the enthusiastic revellers. This is the first Tennent's Vital festival since 2007 and the latest major concert held in Bangor following the appearance of Snow Patrol there last summer. The Script were the headliners and did not disappoint with a playlist packed with hits including If You Ever Come Back and The Man Who Can't Be Moved. O'Donoghue delighted the youthful audience with regular walkabouts to shake hands. Guitarist Mark Sheehan even took a photo of the forest of raised arms with his phone for Twitter, the reaction typical of the band's global acclaim. The Script's latest album peaked at number three in the Australian and American charts. The band sold more than 100,000 albums and singles in one week in the US. In June they headlined an outdoor show at New York's Rumsey Playfield and they are returning to the US for a 31-city tour. Single Science and Faith debuted at number one in the UK and Ireland. The Script played at Belfast's Odyssey Arena in March.